THERE ARE MANY GREAT UPCOMING EVENTS DESCRIBED BELOW...SOME ARE ON THE WHARF ITSELF AND SOME ARE HELD NEAR THE WHARF. Ride the free MST Trolley to the Wharf from the East and West Garage on weekends. MST Trolley details click here. BE SURE TO SAVE THE DATE FOR THE 10TH ANNUAL WHALEFEST MONTEREY ON JANUARY 25 & 26, 2020. DETAILS BELOW. ARE YOU LOCAL & LIVING IN MONTEREY COUNTY? 2 HOURS FREE PARKING FOR LOCALS MONDAY-THURSDAY WITH MONTEREY COUNTY ID. 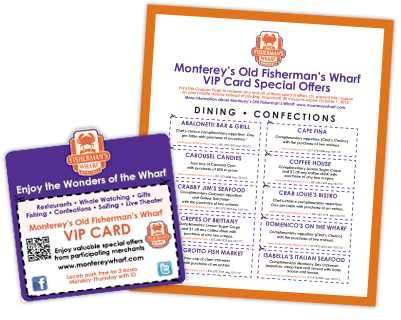 DOWNLOAD OUR "WONDERS OF THE WHARF VIP CARD" BEFORE YOU VISIT MONTEREY'S OLD FISHERMAN'S WHARF AND ENJOY 23 SPECIAL MERCHANT OFFERS!